Teaching from nine in the morning to nine at night might sound a little crazy; but, passion drives one to do such, I suppose. What are you passionate about? What could you spend twelve hours doing in a day? I used to be really passionate about video editing. I’d hardly sleep during project season in college. Nights with the Avid Media Composer, or in the multimedia lab would pass quickly, too quickly, and it seemed like I could never tweak enough. Then I became enthralled with traveling. Still am. Maybe borderline obsessed. I’m going to travel everywhere forever, and there’s nothing you can do to stop me. Take that, world. Next I fell in love with photography. I purchased my first Nikon DSLR about five years ago, and haven’t missed a snap since. Well, except for when someone knocked me unconscious and stole my camera in Guyana. That forced me to stop taking photos for a few weeks. Most recently I’ve developed an insatiable desire to teach. Thanks to my experience with Peace Corps, and now the opportunity to live and work in South Korea, I’ve found the perfect career to feed my fervent palate. I think it’s safe to say I’m a passionate person. Many of my hobbies and interests drive me to the point of near mania. I’m simply addicted to all things life, and can’t seem to get enough. That’s why I need coffee—an addiction for my addictions. It’s the middle of one of the busiest weeks at school. 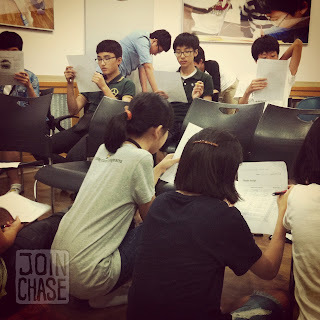 The semester ended last week, and I’ve begun instructing “Summer Fun” English Camp, a two-week intensive, interactive, and (almost) full-immersion experience for 40 of my elementary students. 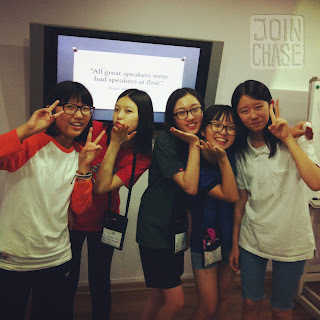 Advanced middle school students at CBFLIS in Jincheon. English camps provide kids with the opportunity to further their English skills. Especially children from families that can’t afford to send them to private academies for extra lessons. By contract I’m required to facilitate two English camps a year. I love them, but they’re a ton of work. If you aren’t aware, teaching takes a lot of extra effort “behind the scenes”. My 'behind the scene' happens during twilight—when what is night, and when is morning blurs. Point is I don’t sleep much during English camp. Sometimes I get up around four to start preparing for a day. And I don’t start teaching until nine. By nature I’m an overachiever, and I always fill my plate too full. I’m that guy at a potluck, or in the buffet line, trying to support my disposable dish with two hands so the mountain of food on top doesn’t snap it in half. But, I always find room for dessert, just like I always find time to get everything done. Somehow. I agreed to teach extra courses at Chungbuk’s Foreign Language Institute for Students (CBLFIS) again. 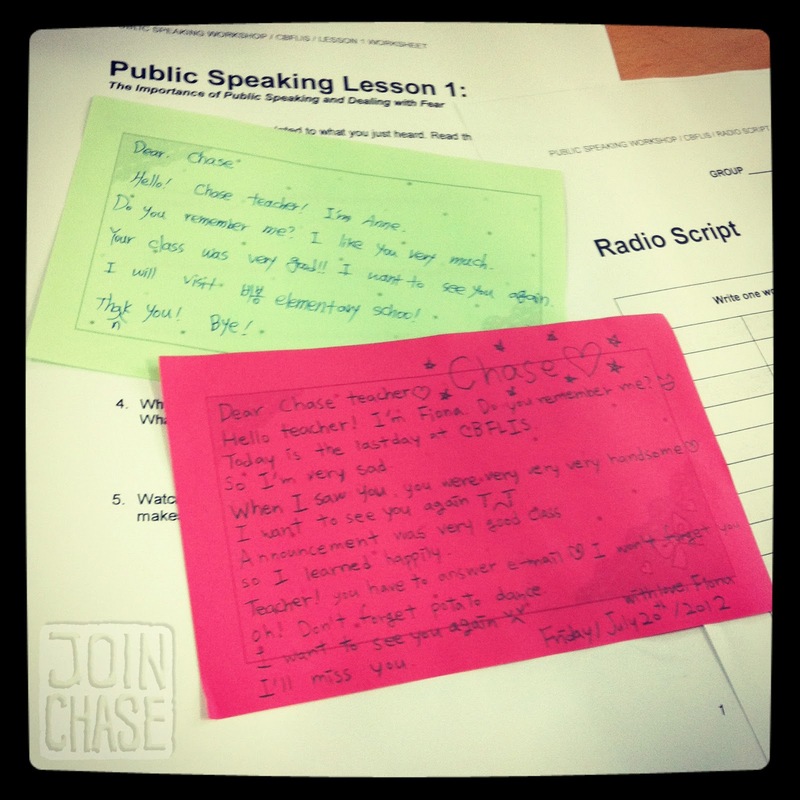 Of course three of my six evening sessions at CBFLIS happen to be during English camp. In addition to English camp, and instructing radio announcing and public speaking at CBFLIS, I also agreed to help prepare some of my advanced students for an upcoming English contest. So, yeah, that’s why I’ve been teaching from nine to nine. I received two notes of gratitude this evening, both from students I taught at CBFLIS over the past few weeks. They were simple, but heartfelt. And exactly what I needed after a long, hard day. Perhaps the best part of my job is when I’m told what I do is appreciated, that what I’m doing matters. So often we forget, or get lost in thankless, long days of work. Little reminders from students give me enough energy, the only reason I need, to do it all over again. I am grateful you exist. I am grateful you do what you do - in all its "Chase-like" wonder. JOY! What a wonderful thing to say to someone! I hope you know I'm very grateful you exist too, and for all the joy you've spread to so many.